Orange is for the edge of the night. I used a file folder to create a cross template. Easy to make: Fold the folder in half "hot dog" style, draw half of cross, cut out, and you're ready to go. My template has a border that is about 3/4" wide. Folding the pieces of construction paper in half "hot dog" style. Trace 1/2 the cross onto the paper. 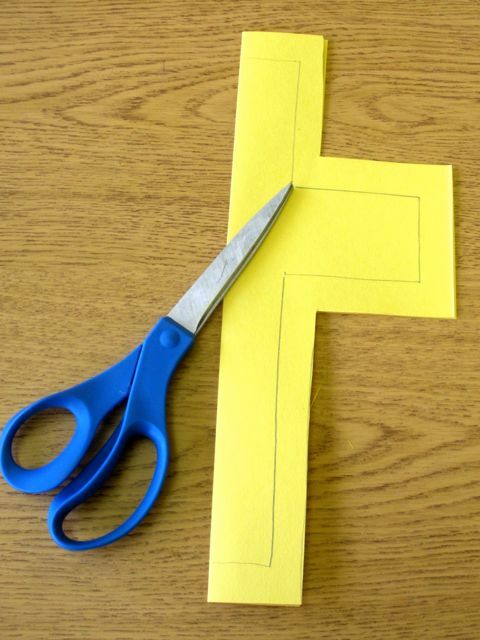 Make sure you are tracing along the fold so the cross will stay connected when it is cut out. You will need to keep the paper folded in half to cut out the cross. If you teach kinders, DO THIS STEP FOR YOUR STUDENTS. You can do this one yourself or leave this task to the students. After receiving very careful instructions, my kids did it in class and it was an experience! Great opportunity to teach the importance of following directions. Some children had an easy time. Others had lots of pieces when they were finished. We made it work. If your time is limited, you have a challenging class, or you just don't want a headache, let a volunteer cut out the crosses. Peel the contact paper and place it sticky side up on the table. CENTER THE CROSS ON THE CONTACT PAPER FOR YOUR STUDENTS. If this kids attempt this one themselves, you will end up with a lot of wrinkly, folded crosses stuck to a wad of contact paper. Kinders are great at turning a clean sheet of contact paper into a wad! Now the fun part. 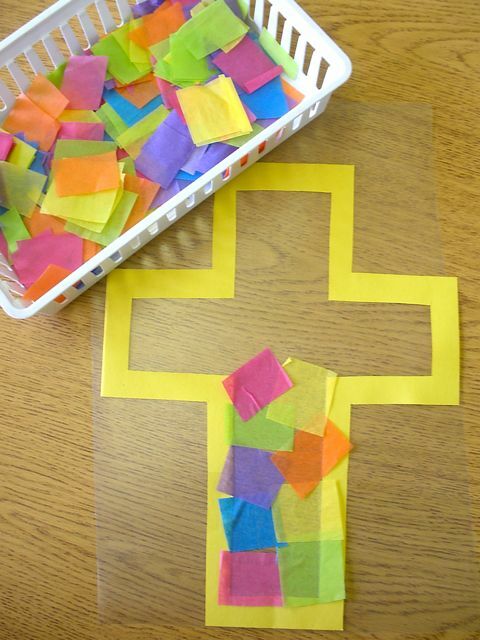 Let students fill in the cross with the tissue paper squares. Have them avoid touching the actual contact paper. Some will, but the fewer kids with contact paper stuck to their hands, the better off you will be! 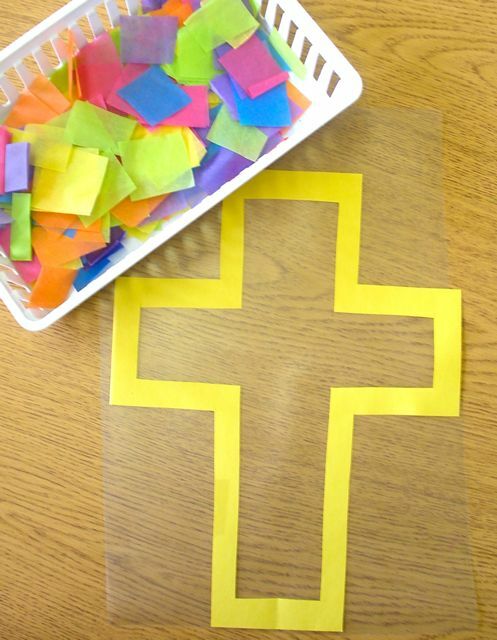 Use the 2nd sheet of contact paper to "seal" the cross together. This step is optional, but I don't like to have loose pieces of tissue paper blown off by the wind. The simplest way to do this (and avoid wrinkles in the paper) is to place the new sheet of contact paper sticky side up, then flip the cross page onto it. 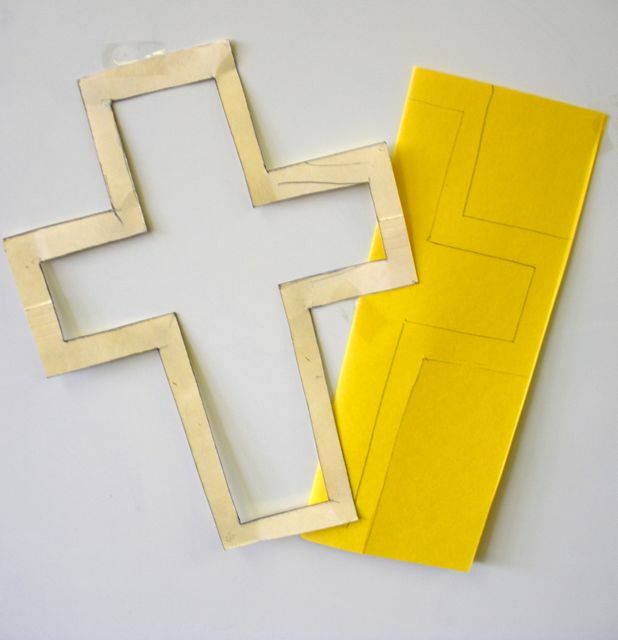 Use scissors to cut excess contact paper from edges and crosses are ready to hang. Trim off the large leaves from the broccoli stem. Remove the tough stalk at the end and wash broccoli head thoroughly. Cut the head into flowerets and the stem into bite-size pieces. Place in a large bowl. Add the onion, raisins, carrots, sunflower seeds and vegan cheddar. In a small bowl, combine the remaining ingredients, stirring well. Add to broccoli mixture and toss gently. Season with freshly ground pepper and salt. Stress and anxiety are the body and mind's way of communicating that it is feeling overwhelmed. Stressors can include problems with work, family, finances, life events, illness, loss and sometimes even perfectionism. Usually this reaction builds up over time and if you are used to coping with a lot of stress and demand you may not recognise what the limit is until it overflows. This is why it is important to recognise your early signs of stress. What is good and bad stress? Everyone is different and can cope with varying levels of pressure and demand. Some people even thrive on it. In fact, not all levels of stress are harmful. Athletes, for example, need a good level of excitement and adrenalin to perform optimally. Stress and anxiety are our innate reactions designed to keep us safe. During the primitive hunter gatherer times our bodies evolved to cope with the dangers they faced. Today's stressors are somewhat different but the body can still react in the same way as it did back then which can leave us feeling demoralised, frustrated and exhausted. Understanding your own stress levels and how they impact your energy and performance will help you to manage it better and use it to your advantage. If stress is ignored it can lead to physical health problems such as headaches, backaches, sleep problems or an impaired immune system. Links have also been found between stress and coronary heart disease. Psychologically it can potentially, but not in all cases, lead to more severe forms of anxiety, such as obsessive compulsive disorder (OCD), panic attacks, social anxiety or health anxiety for which professional help is advised. The first step is recognising you are becoming stressed and taking a step back to identify its causes. Write a stress diary logging your stressors, how you coped with these, and how you would prefer to cope in the future. Enlist support from others - it can be lonely with stress as your companion. It is important to find time to relax and unwind. Balance stress with relaxation and pleasurable activities - without the guilt! Make sure the cream cheese is cold and pinch off an egg-sized hunk and roll it in your dry hands to shape. Then roll it in colored sugar on a plate. Make sure to keep cold, or it will sweat and melt the sugar. Spread on graham crackers (I used cinnamon grahams). Easy and fun! Line a 15x10x1-in. pan with foil; grease foil with butter. In a microwave, melt candy coating; stir until smooth. Spread into prepared pan. Top with jelly beans, pressing to adhere. Let stand until set. Cut or break bark into pieces. Store in an airtight container. Yield: 2 pounds. Melt your morsels on the stove using a double-boiler or in the microwave on 70% power. Be careful to stir frequently so that you do not burn the chocolate!! If you are using the microwave, heat in 30-second intervals, stirring in between, until fully melted. 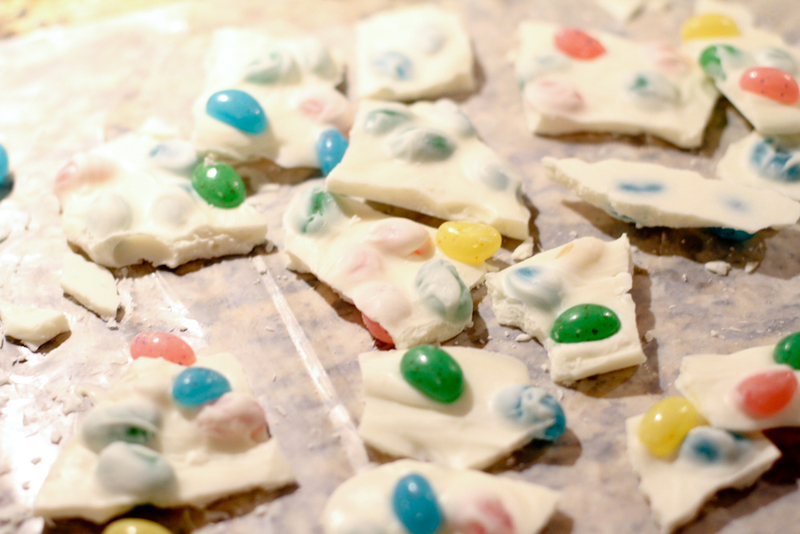 While your chocolate is melting, line a cookie sheet with wax paper Lay half of the jelly beans on the pan Pour the melted chocolate over the jelly beans and use a rubber spatula to spread it across the pan creating an even layer. Place the remaining jelly beans on top of the melted chocolate. Allow to cool at room temperature for several hours or put in the refrigerator to cool for one hour. 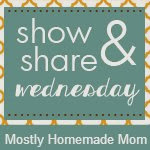 Peel away wax paper and break into 2 to 3-inch pieces. I love spring but along with all the beauty and warmth that spring provides lots of problems for those who suffer from allergies. Kids are among those that suffer from allergies and there are a few things that you may be able to do to lessen their suffering. To help prevent those red, itchy eyes, runny noses and scratchy throats you can either keep them in a well sealed area which would be no fun for anyone or do what you can to make those that suffer from allergies more comfortable. Using boogie wipes saline mist will help to thin mucus and relieve nasal congestion while washing away pollens that creates the sneezing. At times it is hard to tell if what your child has is allergies or something else. A few things to keep in mind is if your child seems to be sick and have same symptoms during same time each year then it is probably allergies. However, if you are unable to tell visit your local peditrician who may refer you to an allergist where a skin test can be performed to determine which pollens may be problems. Be creative this year and have some fun when coloring your Easter eggs. Place eggs in a large pan. Using a strainer remove the eggs place in bowl and cover with paper towel. Let sit over night this may make the egg shells weak so be sure to carefully remove the eggs and let air dry so that the shells will harden again. 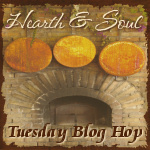 Blue: Red cabbage leaves or blueberries (crushed) - Pre-boil red cabbage leaves for 30 minutes. Combine yeast, sugar and milk in small bowl or jug; cover, stand in warm place about 10 minutes or until mixture is frothy. Sift flour and spices into large bowl, rub in butter. Stir in yeast mixture, egg and sultanas; mix to a soft sticky dough. Cover; stand in warm place about 45 minutes or until dough has doubled in size. Turn dough onto a floured surface, knead about 5 minutes or until smooth. Divide dough into 16 pieces, place piece of chocolate into each piece of dough and knead into balls. Place balls 8cm apart onto oiled oven trays, stand in warm place about 10 minutes or until buns have risen. Meanwhile, preheat oven to hot. Place flour paste for crosses in piping bag fitted with small plain tube, pipe crosses on buns. 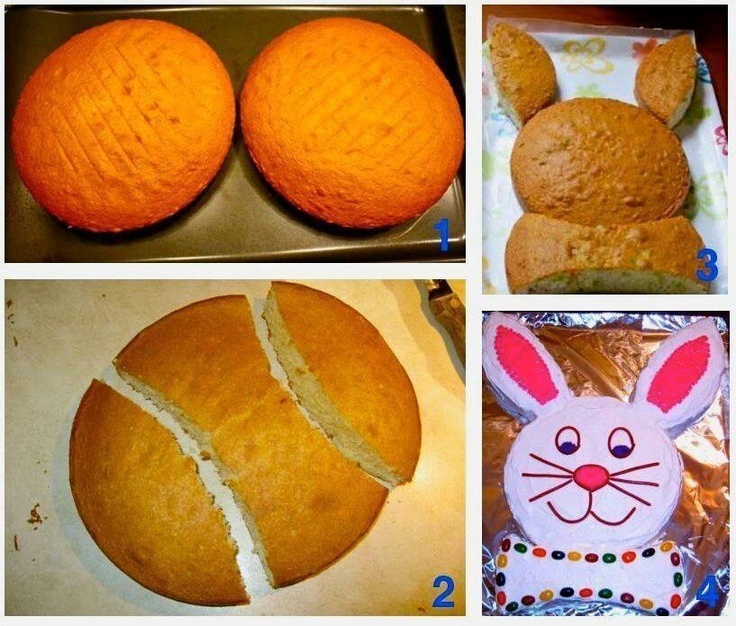 Bake buns in hot oven about 20 minutes or until well browned. Turn buns onto wire rack, brush tops with hot glaze; cool on wire rack. To make the flour paste for crosses, combine flour and sugar in bowl. Gradually blend in enough of the water to form a smooth paste. To make the glaze, combine ingredients in small saucepan; stir over heat, without boiling, until sugar and gelatine are dissolved. 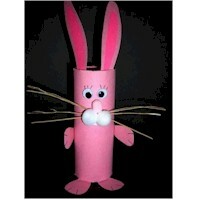 I love these easter nest from Nestle how super cute. We make haystacks each year at Christmas why not carry that easy idea over to Easter and make these beautiful easter or bird nest? LINE trays with wax paper. ADD chow mein noodles to morsel mixture; toss until coated. Using ice cream scoop that measures about 2 rounded tablespoons, scoop and drop onto prepared trays then immediately shape into nests. Refrigerate until ready to serve. Before serving, place one or two NestEggs in each nest. Store prepared nests in covered container for up to 1 day. Banana pudding is the one have to have Easter desserts. My husbands mother and grandmother made this every year. Now with them both gone (missing them every day) it has come to individuals such as myself and my sister in laws to prepare an Easter Dinner that would be approved by them. While they always made everything from scratch there are those times when time runs short and we look for short cuts. This no bake banana pudding recipe tastes great and pleases everyone as well. It is also a great dish to get the next generation involved. ﻿Mom may have made the pudding from scratch in her day and oh my the taste I will never forget this recipe which combines instant pudding mix with sweet condensed milk, cream cheese and cool whip you will get a taste that will delight the taste buds of all. Line the bottom of a 13x9x2-inch dish with vanilla wafers; top with the sliced bananas. In a bowl combine the milk and vanilla pudding mix; mix with a hand mixer. In another bowl mix together the cream cheese and sweetened condensed milk. Fold the whipped topping into the cream cheese mixture; add to the pudding mixture and stir until well blended. Pour the pudding mixture over the bananas and top with vanilla wafers. Refrigerate until chilled. This tastes and looks best the day it is made. Our family has a tradition of making sweet rolls at Christmas time. 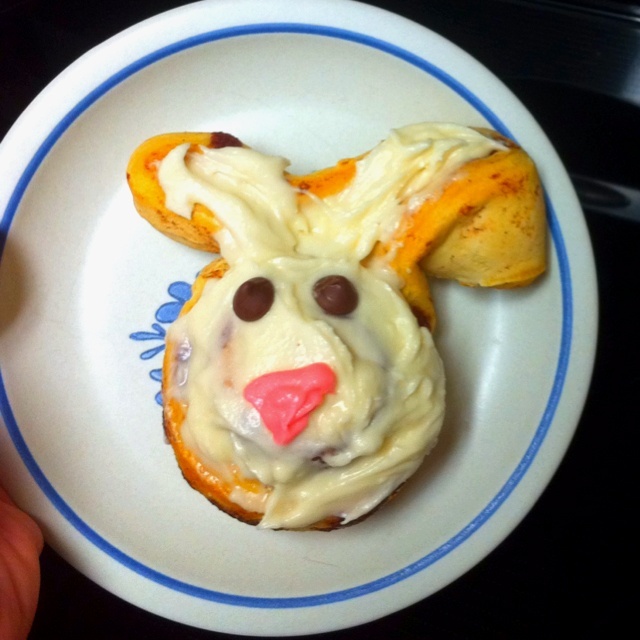 After seeing the super cute easter bunny sweet rolls I think we may have a new tradition for Easter as well. These are so super cute and easy to make I even like the idea of allowing everyone to decorate their own. These were just too cute not to share! And so simple...no recipe required to make these little Easter chick cookies. All you need is Nutter Butter cookies,white almond bark, yellow food coloring, black icing to make eyes, and orange icing for to make the beaks. ﻿Melt the almond bark in the microwave, according to the package directions. Then add a little yellow food coloring to make it pale yellow, but you could make bright yellow or even pink and blue...like Peeps. Then dip the Nutter Butter cookies into the almond bark and place on waxed paper to cool. When the almond bark coating has hardened, decorate each chick with two black icing dots for eyes and a small orange triangle for a beak. Simple enough to let the kids help with. In a large bowl combine the cereal, pretzels, candies, and peanuts. Meanwhile melt the bark according to the package instructions. Pour the melted almond bark over the cereal mixture and mix well. Be careful not to crush the cereal and pretzels. When well coated, pour onto wax paper to cool. After it has cooled break into pieces and store in an airtight container. 2. second is to cut as pictured with two rounded ends and the middle being shaped in an hourglass shape. 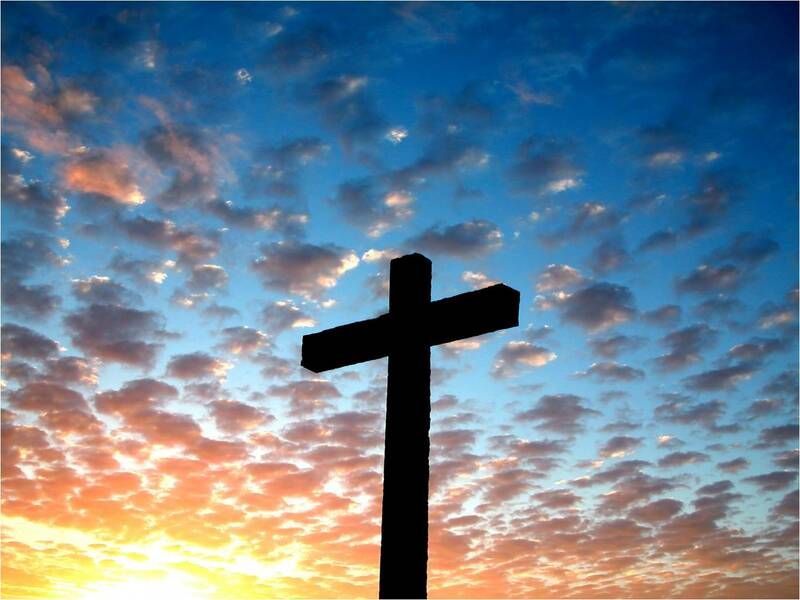 Holy week is recognized by the Christians in the world. It is the last week of lent and is always the week before Easter. Yesterday was Palm Sunday, this week also includes Maundy Thursday, Good Friday, and Holy Saturday. This week does not include Easter. Why not celebrate this week with a little treat for all. This crown of thorns will help share the story with all the little and big ones. Spread the peanut butter onto the sugar cookie or cracker. Place the mini twist pretzels around the edges of the spread peanut butter and press to secure.